The 'Di Blasi' is a motorcycle manufacturer of mopeds bicycles and tricycles leaflets, suitable to be transported to car, boats and airplane as auxiliary vehicles or for people with prevented or reduced mobility. The design and production of vehicles, is performed entirely in Italy. The company was founded in Vizzini, in the second half of seventies by Rosario Di Blasi, a former pilot of' Italian Air Force. Appreciated expert flying technique, is the inventor of the "Ruler for Carteggiare", a tool to perform the necessary calculations to air navigation, which he achieved in 1940. After the WWII, Di Blasi back in home in Sicily to deal with the family farm, however, continuing to cultivate his passion for mechanics. 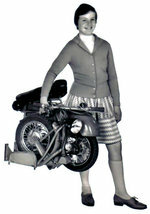 They are, in fact, in 1950 the first prototype foldable scooter made for the purpose of study and experimentation. 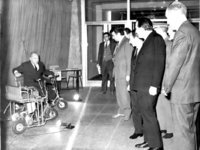 Ulteriorte a step towards the future activities of the manufacturer is accomplished by presenting, at exhibition industry in Turin of 1968, a folding tricycle suited to the needs of people with disabilities, called "DIBLA 7", easily transportable and with propeller 2T Zanetti. At the beginning of 1970 is tested innovation conformed to the chassis articulated quadrilateral deformable. This idea, protected by international patents, was applied to a folding bike (modelAvia) and a moped folding modelR2: two vehicles characterized by extreme ease of folding and details particularly original, like the first pedals folding ever produced. These vehicles were displayed for the first time Exposure Cycle and motorcycle Milan of 1973, obtaining good appreciation of the press, immediately followed by a commercial success, as well attractiveness of the products, was also encouraged by the first major oil crisis whose result, in Italy, were the famous "car-free Sundays, best known as" austerity. " The first set of folding moped "R2", equipped with engine Morini Franco brand and known in Germany under the trade name of Toy Storyis now much sought after by fans of vintage motorcycles. In 1979 model "R2" was replaced by the model "R7" which was mounted on a Di Blasi engine, with variable-speed automatic. Over the years this moped was then subject to continuous updates. His job opportunities are manifold: as the auxiliary motor vehicle, boat or car. It is also used as an auxiliary vehicle on board helicopters for theState Police. Folding Di Blasi R7 moped supplied to the State Police in 1985. Even bicycles have been evolving, improving the characteristics of size and weight: after the "Avia" came the models "R20" in 1980, "R50" in 1984 "R6" in 1991, "R4" in 1995, until the current model "R24". 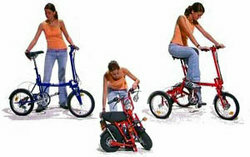 In 2000 has begun to manufacture a folding tricycle for people who have difficulty in cycling. Also to record the achievement of a hospital bed.